Last week I wrote a comment piece for The Guardian, in connection with the Bank of England’s latest figures on the use of cash. I put an expanded version of the piece here on the blog. Little did I know just how immediate and widespread would be the influence of this polemic. Only a day later and the Chief Economist at the Bank of England was agreeing with me, for sound monetary policy reasons. “It would allow negative interest rates to be levied on currency easily and speedily,” Mr Haldane added, using technology similar to that embodied in Bitcoin. A couple of days after that, and the noted economist John Kay (I am reading his excellent book “Other People’s Money” at the moment) is agreeing with me as well! In yesterday’s Financial Times he also noted the strange paradox of cash use falling yet cash “in circulation” continuing to rise and drew the same conclusion that I did. We need policy action. The volume of currency in circulation has risen as the need for such currency in legitimate activity has declined. This is not a comforting combination. Policymakers should progress towards a cashless society. So let’s take it as read that it should be government policy to start reducing the amount of cash in circulation and that the Bank of England needs to come up with a plan to introduce a digital alternative. The Chief Economist touched on this, although his implausible implementation outline involving “technology similar to that embodied in Bitcoin” owed more, I think, to newspaper nonsense about cryptocurrency than to reasoned high-level architectural reflection, since the computational expense of a proof-of-work blockchain is completely pointless in a centralised Bank of England e-fiat digital cash scheme. Nevertheless, his point about a Bank of England electronic cash alternative is worth examining. “This would preserve the social convention of a state-issued unit of account and medium of exchange, albeit with currency now held in digital rather than physical wallets,” he said. I noticed that some commentators took this remark to mean something positive for Bitcoin. That I seriously doubt, since the whole point of Bitcoin is to not have an issuer. As Chris Cook said on Twitter, this would be a financial platypus! Had Andy been more informed on the complexities of digital money and had he consulted a relevant expert (eg, me), I imagine that would instead have said “a technology similar to that embodied in M-PESA, Venmo and FPS”. The idea of the Bank of England running a national pre-paid account scheme is not at all far-fetched and if it was given a decent mobile front-end (like Venmo), had instant transfers in and out of the banking system (like FPS) and was super-efficient since transfers between accounts would just be a few bytes changing in a database (like M-PESA) it could easily handle a few thousand transactions per second. And with some decent APIs for developers to get hold of, it shouldn’t take long before it became a standard component of national commerce and, as Adam Smith would have said, a superhighway bringing goods and services to market. Naturally the system should work on the basis of paynames so that if, for example, you wanted to make a valuable contribution to a worthy cause, such as the Dave Birch Holiday Home in the South of France Emergency Appeal Fund, then you would simply use your Bank of England app to send the e-cash to £dgwbirch. Anyone would be able to open an account – no KYC/AML/ATF or any other buggering around until the amount transacted exceeded £10,000 – and we could fund the whole thing by selling vanity paynames. I’m sure someone would pay a shedload of money to get £007 or £888 or £wad or £sergioaquero or whatever so it wouldn’t even cost that much to put together. I should have liked to have put this idea forward as part of the UK’s Payment Strategy Forum but unfortunately the powers that be decided there was no room for a tribune of the people and influential innovator in this august body. Apple Store, Covent Garden (September 2015). Apparently, oligarchs and drug dealers are slow to convert to tokenisation. If the government really was committed to innovation, then it would have included cash in the Payment System Regulator’s remit and given her specific targets for a reduction in the total social cost of payments in the economy. Had this happened, then the idea of a national e-money would already been under discussion. I shall mention this at the Payments UK Customer Engagement Network coffee morning today and test the water. 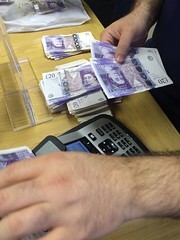 Your contention about the main application of cash being criminal activity is supported by the runaway demand for Euros when the new currency was first issued (which was mainly attributed to the existence of Euro 500 banknote, having a fivefold saving in the volume of transportable cash). This means that, since any government-sponsored e-cash project would be of no use to a criminal due to traceability and lack of anonymity, it will not reduce criminal demand for cash. On the other hand, any restriction on the use of cash will sooner or later result in a departure from the parity in the exchange rate between bank funds and banknotes (there are several examples of that in the recent history), which will result in flight towards cash: exactly the opposite to what you are advocating as a goal for the British economy. Finally, users of ATMs are not paying for the cost of cash (which is marginal for the bank dispensing the banknotes): the main bank’s budget item that is paid for by the ATM user is the cost of the ATM itself. Correct. Hence we must reduce the supply.